Let me start by showing you some very colorful maps created by Alicia Bentley (a NOAA/NWS employee!) 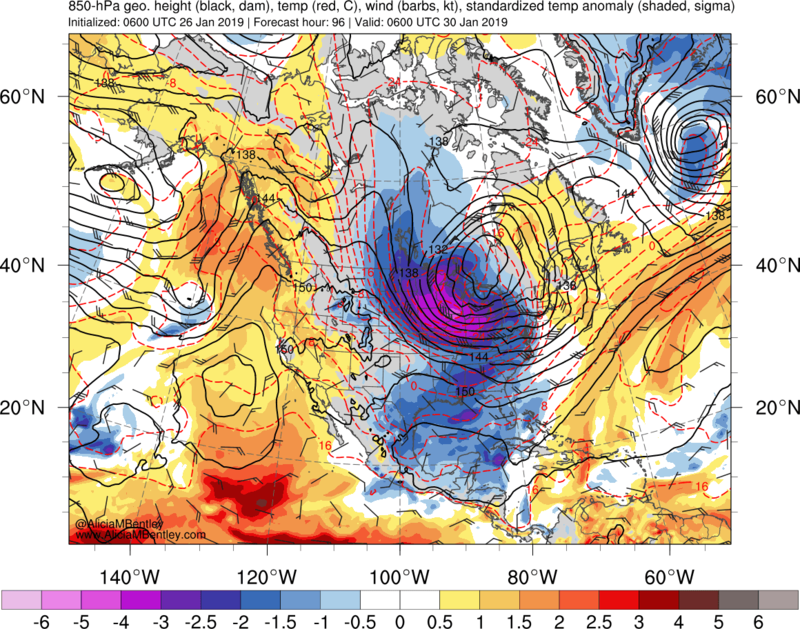 These show the upper level maps (500 hPa pressure level, about 18,000 ft ASL), with the heights of the pressure level shown in black, and a measure of the differences (or anomalies) from normal shown in colors (orange/red are above normal, blue/purple below) normal. Today at 10 AM (1800 UTC) there is a big ridge of higher heights (think high pressure) over the West Coast and a trough (lower heights/pressures) over the east. Major anomalies, with the purple colors indicating very usual low heights. Ridges tend to be associated with sinking air and warm temperatures in the lower atmosphere, while troughs are connected with cold air. So let me show you the anomalies for temperature around 5000 ft (850 hPa) at the same time as above (10 AM today). Warm air along the West Coast, but cooler air in the east, with a slug of very cold air moving into Minnesota and environs (see below). In fact, we do have very warm air above us right now. The balloon-launched weather reports at Quillayute, on the WA coast, are shown below (the two lines are temperature--the warmer one--and the other is dew point). Winds to the right and heights are in pressure (700 is roughly 10,000 ft). Very warm air aloft, with a freezing level (when temperature falls to 32F) ABOVE 10,000 ft. Toasty. There is some cooler air near the surface, with an inversion (temperature warming with height) in the lower atmosphere. The mountains will be toasty today. In fact, at 9 AM Stampede Pass at 4000 ft it is warmer (40F) than Seattle (38F and fog). The latest satellite pictures shows the low-level fog over the lowlands of western WA/Oregon and parts of eastern WA. That is the great irony of high pressure over the Northwest in winter. When we have high pressure over us during mid-winter, with warm temperatures aloft, we can't mix the warm air down and we tend to develop low-level inversions and near-surface fog. But all you have to do is gain elevation and you can escape the cool stuff. Offshore (easterly flow) can destroy the cold air layer and later in the season, when the sun is stronger, solar radiation can do the job. But then we get to the story that the media is already starting to pick up on-- the deepening of the East Coast trough accompanied by a slug of MEGA-COLD air. Here is the 500 hPa upper level map for 4 AM on Wednesday (January 30th). Extraordinary low heights over the upper Mid-west (the light purple colors--the anomaly from normal in standard deviations--are amazing). Ridge of high pressure off our coast (dry for the NW). The 850 hPa (5000 ft) temperature anomalies (again differences from normal) coming into the Upper Plains state will be amazing and some locations will probably break record lows for the date. I suppose this means that once gain we can probably forget about lowland snow this year? An all too familiar pattern for us.However,it looks like the models are increasingly hinting at a retrogression of this pattern in the next week or two.Maybe all is not lost this winter for the cold wx and lowland snow lovers. Perhaps some "backdoor" Arctic air action could still be possible for us. Went skiing at Mission Ridge Thurs-Fri and we were shocked at how warm it was for January. Soft snow - more like spring. Also, the snow level over Snoqualmie seemed usually high for this time of year. Enjoy reading your posts Dr. Mass..
As a person who has never lived south of 46N latitude. A mild winter is a welcome thing. That one map has the bulls eye right over my poor relatives in Northern Lower Michigan! I was raised on a farm in the dakotas. On cold snaps like that you had to run to the barns. It was a cruel windchill. The sidewalks absorbed the cold temps and when it warmed back up they were covered in frost, as the concrete like a battery released it’s energy post event. A memorial of sorts to what we had endured. Typically the cold was worse a day or two after a snow event. 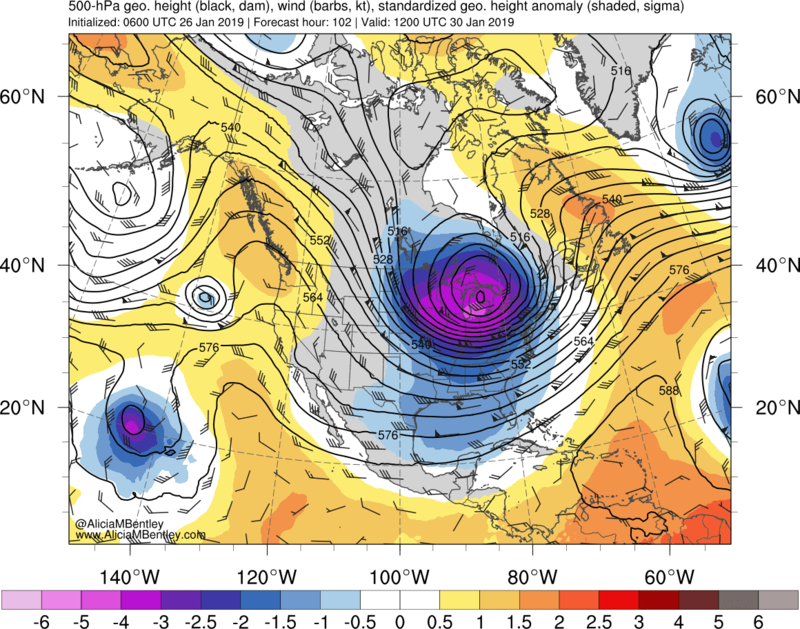 Having distinct memories of the unbelievable winters of 1977 - 78 and 1978 - 79 in Chicago, these kinds of polar vortexes seem to occur about once every six years or so. At least this one won't last more than a week, but you can easily freeze to death if you're not covered head to toe when you head outside. It's not for sissies, that's for certain. "I suspect a certain President will tweet about this event, suggesting it contradicts global warming, and some activist/media types will claim it is the result of global warming. Neither will be correct. Perhaps something I will talk about in a future blog." When did this annual cycle of Arctic Vortex Collapse begin, Prof. Mass? This century. Was it a unique rareitybefore 1998, Prof. Mass? Yes it was. Is it in anyway related to the warming of the B-K region of the Arctic Seas? Perhaps. Sudden Stratospheric Warming (SSW)? We have another 2 to 3 weeks and then the snow chances drop substantially. The next week looks lost for sure. Forecast high for Minneapolis on Wednesday is -13! Cliff, can you give us some insight on where this ultra-cold air is coming from? I'm guessing it's not just polar air, but is being brought down from very high in the atmosphere. What are the physics going on here? As WSU Alum, I have to say you are one of the few people from UW that I respect as being a cut-above! Let's face it, the UW Atmosheric Sciences program is second to none! I was just talking with a fellow Coug today about how I miss the snow on the Palouse! Dr. Mass it's always a pleasure to read your blog, and to listen to you on KNKX! Today (sunday) temperature reached 56 degrees at my house east of Cle Elum under sunny skies. "In 2018, surface air temperatures in the Arctic continued to warm at roughly twice the rate relative to the rest of the globe, a phenomenon that has been termed 'Arctic Amplification.' The year 2018 was the second warmest year on record in the Arctic since 1900 (after 2016), at +1.7° C relative to the longterm average (1981–2010). Arctic air temperatures for the past five years (2014–18) have exceeded all previous records since 1900. Growing atmospheric warmth in the Arctic results in a sluggish and unusually wavy jet stream that coincided with abnormal weather events in both the Arctic and midlatitudes. 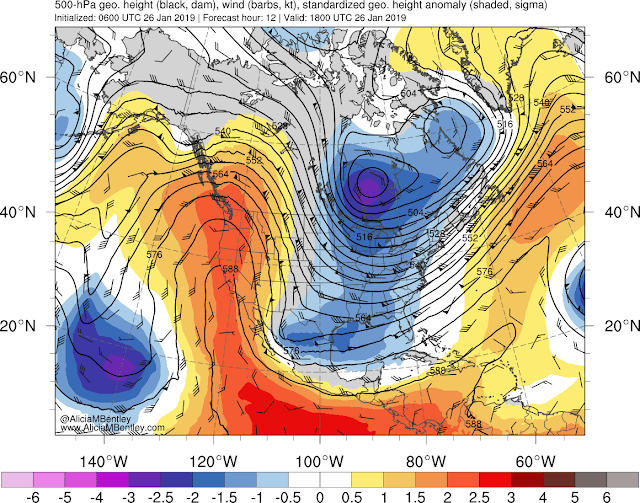 Notable extreme weather events coincident with deep waves in the jet stream include the heat wave at the North Pole in autumn 2017, a swarm of severe winter storms in the eastern United States in 2018, and the extreme cold outbreak in Europe in March 2018 known as 'the Beast from the East.'" Dr. Mass, these systems confound my understanding of winter circulation. I tend to assume that very cold air is dense and creates high pressure, and warmer air creates areas of low pressure. 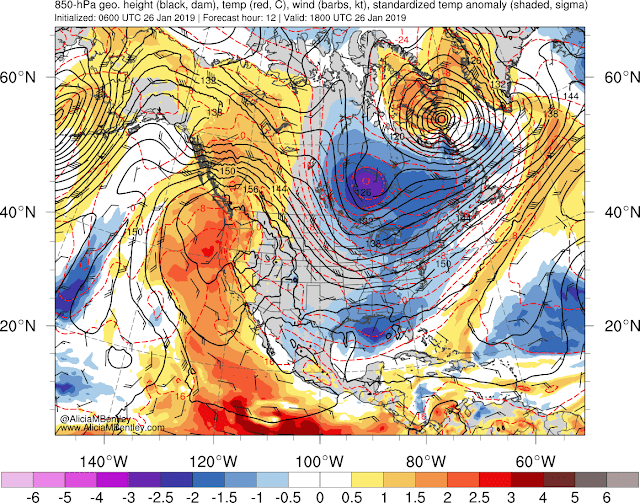 Yet when I look at the atmospheric maps from UW, with overlaid fronts, that isn't what appears to happen, which is of course what you've said in your post. Adding to the confusion is that there appears to be a ridge of even higher pressure East of the NW, between us and the Midwest. Are those systems to our West likely to break down the current ridge and trough and return us to a rainy period? January is more than extra-ordinarily dry this year. Why does is seem that the Pacific Northwest is immune to extreme cold or snow? I hope we return to a wet pattern soon. This dry weather is depressing. Not immune but almost. Our weather is dependent on the Ocean we live next to and also the North Pacific Gyre. The North Pacific High and Aleutian Low battle for dominance off our coast in addition to that and lately that Low is losing. The PNW is also constantly being feed directly by the trade winds that flow from Hawaii. Most of what happens here requires quite a careful alignment for cold and snow, as the default is going to be either warm and/or dry. "I suspect a certain President will tweet about this event, suggesting it contradicts global warming..."
You called it! We even got a misspelling, too. Me three! Prof Cliff Mass is respected locally as a weather forecaster not as a Climatologist. He knows local weather. He does not know Sudden Stratospheric Warming not Arctic Atmospheric Warming. And Dr. Kenneth M. Beck has no credentials in meteorology or climate science, yet has a blog that makes pronouncements anyway. It's what "progressives" do: throw stones within their glass houses.